ESPN has announced another record setting year for their digital media properties in 2009. A couple of items to note. The first is the "announcement" that ESPNNewYork.com will be the next local ESPN site to launch, and that will happen in the spring of 2010. Anyone See the Subliminal Irony? Kudos and a shout out will go to anyone who sees the subliminal irony in this image. Image courtesy of ESPN. The other item is that ESPN is helping to give increased credibility to the Huffington Post by entering into content syndication agreements with the Huffington sites in Chicago and Los Angeles. Here is the full release from ESPN. ESPN Digital Media closed another record-setting year in 2009, highlighted by new milestones and record audience growth. On all platforms -- online, mobile, broadband, games, digital audio and more -- ESPN Digital Media set new highs. Among the many highlights, the launch of ESPN Local sites, the successful redesign and continued growth of ESPN.com, and the rapid growth of ESPN Mobile and ESPN360.com led the way. The launch of four local sites in Chicago, Boston, Dallas and Los Angeles were among the highlights of 2009. ESPNChicago.com -- ESPN’s first local site, launched in April, followed by ESPNBoston.com and ESPNDallas.com in September and ESPNLosAngeles.com in December. ESPNNewYork.com is slated to launch in spring 2010. ESPNChicago.com and ESPNLosAngeles.com struck content syndication agreements with The Huffington Post Chicago and The Huffington Post Los Angeles, respectively, as well as collaborations with ABC-owned TV stations WLS and KABC to deliver easy access to local news, traffic and weather. Each of the sites have already established themselves among the top sports destinations for local market fans, with the first three sites collectively attracting more than 2.8 million fans who spent more than 9.6 million total minutes on the sites, according to comScore Media Metrix. The growth of the sites has also seen ESPN bolster its news gathering organization with the addition of award-winning editors, writers, reporters and analysts including Gordon Edes, Mike Reiss, Tedy Bruschi, Chris Forsberg, Calvin Watkins, Richard Durrett, Jeff Caplan, Tim MacMahon, Arash Markazi, Ramona Shelbourne, Mark Saxon, Andy and Brian Kamenetzky, Nick Friedell, Melissa Issacson and many more. ESPN.com began 2009 with a brand new design, creating a sleeker and easier to navigate site, a new award-winning site search, a more dynamic video interface and new industry-leading advertising integrations. The redesign proved itself a hit, as more fans spent more time on ESPN.com than ever before in 2009. According to Nielsen Online, total minutes spent per month on the site surpassed the 1 billion mark, up 24 percent compared to last year, and unique users per month were up 9 percent to an average of more than 21.6 million. According to comScore, total minutes spent per month on the site were up 27 percent to nearly 1.4 billion, while unique users per month were up 9 percent to more than 22.5 million. ESPN.com also continues to be the leader in online video, with fans logging in 2.5 billion minutes of video consumed in 2009. It also tops the sports category share of total minutes with 34 percent, surpassing more than the next two closest competitors combined. The extensive library of video content has also expanded and attracted more attention from fans this past year. Its popular weekly live program Fantasy Football Now is now a simulcast on ESPN2 during the football season, driving not only viewership for its time slot on television but also driving traffic back to the program on ESPN.com. The Digital Original series Mayne Street starring Kenny Mayne returned with two new seasons in 2009 and other original series like MMA Live, Inside Deal, and Daily Dime TV continued to serve fans online. ESPN Insider, ESPN’s paid content platform online, also hit its all time high with its total subscribers up 18 percent over the 2008 year end total. Key drivers to this growth include its premium content, features and tools as well as its continued strength with ESPN The Magazine, its loyal readers and a bundle agreement offer with MLB.TV Premium that was made available to the services hundreds of thousands of subscribers in 2009. Following the overall site redesign in January 2009, several new extensions, redesigns and relaunches both in the U.S. and internationally followed suit. Among them, a new-look Action Sports site, the redesign of ESPNOutdoors.com, the relaunch of Racing-Live.com as ESPNF1.com, a World Cup 2010 microsite designed with both a U.S. and a global perspective and more. ESPN Mobile -- including ESPN’s industry-leading collection of mobile Web sites, mobile apps and games, mobile alerts and mobile video (ESPN Mobile TV and Video on Demand clips) -- expanded upon the leadership position the company has established in the fast-emerging mobile content space. ESPN Mobile was also active in mobile application development in 2009, launching numerous apps including ESPN ScoreCenter (in June), which has been downloaded more than 4.5 million times and is the top free sports App in the Apple iTunes App Store. In addition, since its September launch, ESPN Radio has been the #1 paid sports app in the App Store. Other apps released in 2009 include ESPN World Cup, ESPN Fantasy Football, ESPN Fantasy Football Draft Kit, ESPN Streak For The Cash, ESPN NBA.com Fantasy Basketball Draft Kit (in partnership with NBA.com), ESPN Spelling Bee and ESPN Zoom. Additionally, ESPN Mobile delivered more messages and alerts to more fans than ever before -- sending nearly 900 million alerts to fans in 2009, up 170 percent compared to 2008. The number of fan signing up for alerts increased by 117 percent, and the average number of alerts per fan increased 46 percent over the same period. More fans viewed more mobile video on ESPN than ever before as well. Across all carriers, unique viewers of on-demand ESPN Mobile video increased 87 percent compared to 2008 and total minutes spent viewing on-demand mobile video increased 106 percent. ESPN Mobile TV, the 24/7 mobile sports television network available on the FLO TV and MobiTV platforms, added originally produced 30-minute ESPNEWS blocks throughout the day and delivered nearly 850 live events in 2009. Total minutes spent viewing ESPN Mobile TV increased 186 percent over 2008. ESPN360.com had a record-setting year, as the broadband sports television network continued its rapid distribution and audience growth, delivering more than 3,500 live, global sports events in 2009. Its distribution grew to more than 50 million households nationwide, double what it was a year ago, with new deals with Comcast, Cox, Charter, Windstream and more. The service is also available at no cost to approximately 21 million U.S. college students and U.S.-based military personnel via computers connected to on-campus educational networks and on-base military networks (those with “.edu” and “.mil” domains). Its rapid distribution is being outpaced by its usage growth. Viewers to the network logged in more than 17.5 million viewing hours. September recorded ESPN360.com best month ever, with a 250 percent growth in total hours views and a 180 percent increase in viewers. Additionally, dozens of programming deals were completed in 2009, expanding its coverage to include the top five Euro soccer leagues and all four grand slam tennis tournaments as well as college football and basketball, golf, cricket and more. 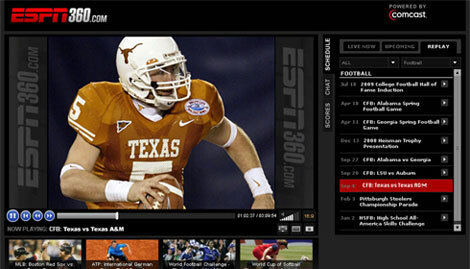 In March, ESPN360.com also introduced an industry-first dynamic advertising insertion platform. The product made its debut during ESPN’s coverage of college basketball Championship Week, when ESPN360.com streamed 124 men’s and women’s games. Over the course of 2009, ESPN Radio listeners (including webcam "watchers") consumed over 78.6 million listening hours of streaming radio and podcast content, according to Ando Media Web Metrics, which measures nearly 7,000 global streams of audio worldwide, including terrestrial radio simulcasts and online-original streams. In 2009, ESPN Digital Audio reached a milestone when ESPNRadio.com was named the single most listened-to online stream of any terrestrial broadcaster in the world -- reaching more than 420,000 unique listeners per month -- according to Ando Media. It achieved a record high of more than 765,000 listeners in October 2009. Total listening hours (TLH) for ESPNRadio.com’s live stream grew to an average of 5.7 million per month, while average monthly cumulative audience (CUME) grew 64 percent to 457,000 in 2009. ESPN podcasts continued to lead the industry and see record growth in 2009 with a year-to-year increase of more than 44 percent (reaching nearly 127 million downloads through ESPN PodCenter and iTunes) including The BS Report with Bill Simmons, which logged in more than 25.4 million downloads in 2009. ESPN saw marked growth in the games arena, including both fantasy games and casual online games. ESPN Fantasy Games continued to grow in 2009, with fantasy related content on ESPN.com averaging 3.2 million unique users per month, up 14 percent from last year, according to comScore. Additionally, total minutes spent with the content were up 38 percent from last year to 234.0 million minutes per month. Registered users in the popular ESPN Fantasy Football grew 36 percent while time spent with fantasy football grew 38 percent this season (Aug-Nov). A partnership with NBA Digital to bring fans ESPN NBA.com Fantasy Basketball led the game to a 63 percent growth in users and a 162 percent growth in time spent compared to the previous year (Oct-Nov). The ESPN Men’s Tournament Challenge bracket game also received nearly 4.6 million brackets in 2009, up 43 percent and holding its rank as #1 amongst its competitors. Among the millions of participants was President Barack Obama, who correctly picked the North Carolina Tar Heels to win the title, but finished with his bracket ranked 903,125th overall, just above the 80th percentile. In its second year, Streak For The Cash presented by Progressive, a free daily pick’em game with a grand prize of $1 million to a player that builds the longest streak of correct sports-related picks in a row, received more than 2 million entries and over 150 million picks in 2009. ESPN Arcade, which relaunched in July 2009, averaged 461K unique users per month, according to comScore. Total minutes of time spent on the site for the year was 95.5 million minutes, up 90 percent. The average minutes per user are up 35 percent to 17.3 minutes. November recorded its best month ever, with more than 747K unique users and 11.9 million minutes. ESPN’s long-standing relationship with EA continued to expand in 2009, with deeper in-game integrations such as full broadcast treatments in titles like NBA Live 10 and NCAA Basketball 10. The Emmy award-winning EA Virtual Playbook also extended to new sports, including NBA and college football.